The Grand Canyon is first established as a forest preserve by presidential proclamation. On September 17, the first passengers arrive at the Grand Canyon South Rim aboard the train from Williams, Arizona. Designed by architect Francis W. Wilson of Santa Barbara, California, the historic hotel was built with 22 guestrooms and 10 employee quarters for the legendary ‘Harvey Girls’ on the second floor. Grand Canyon National Park is established by an act of Congress on February 26. A good road into Grand Canyon National Park is built, making travel to the rim easier than ever before. The Santa Fe Railway completes a two-story addition to the Fray Marcos Hotel of 21 rooms. Diesel locomotives begin traveling the Grand Canyon line. Last steam train travels the route to the Grand Canyon. The more economical diesel locomotives replace the classic steam locomotives. Retired by the Santa Fe in 1954, the Fray Marcos Hotel remained closed to the public although the depot continued to service the East-West mainline and Williams-Grand Canyon train traffic. In July, three passengers travel the last regularly scheduled train service to the Grand Canyon. Grand Canyon Depot closes nearly a year following the discontinuation of passenger service (May). United States Congress passes an act to expand the Grand Canyon National Park. On December 30th, Williams’ downtown business district achieves listing on the National Register of Historic Places. 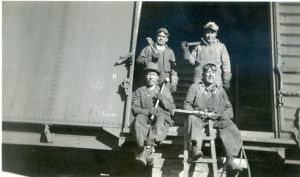 Santa Fe maintenance crews and the field engineer abandon the Williams train station facility for good. On January 10th, Max and Thelma Biegert announced redevelopment of the railway route to the Grand Canyon and the rehabilitation of the historic Fray Marcos Hotel and Williams Depot. On September 17th, the Williams Depot re-opens under Grand Canyon Railway’s ownership. Reconditioning of two vintage 1906 and 1910 steam locomotives take place; each locomotive requires 8,000 to 10,000 hours to rebuild. The Grand Canyon Depot re-opens to welcome Grand Canyon Railway’s trains in July. Grand Canyon Railway carries more than 105,000 passengers per year, which reduces automobile traffic to the South Rim by approximately 40,000 cars. The modern-day Grand Canyon Railway Hotel (built to resemble the historic Fray Marcos Hotel) opens its doors. The Railway begins daily passenger service and re-introduces vintage diesel locomotives to the Grand Canyon line. Steam locomotive No. 4960 makes its first run on the Grand Canyon line after being fully restored. The restoration required more than $1.5 million and 80,000 man-hours. Grand Canyon Railway placed on the National Register of Historic Places. Grand Canyon Railway completes a 107-room addition to the Hotel in February. Also added at this time are the pool and hot tub. Grand Canyon Railway begins running a special Polar Express train to the “North Pole” during the holidays. The Grand Canyon Depot restoration project is complete. In March, the third addition to the Grand Canyon Railway Hotel is complete. The addition adds 92 standard rooms and 10 luxury suites. Steam locomotive No. 29 rides the Grand Canyon Railway line after an extensive restoration involving $1 million and 26,000 man-hours. Grand Canyon Railway carries more than 225,000 passengers per year, which reduces automobile traffic to the South Rim by 10 percent. Xanterra Travel Collection takes ownership of Grand Canyon Railway. The historic Williams Depot celebrates its 100-year anniversary. The Grand Canyon Railway converts to an all-diesel fleet of locomotives, aligning the company with Xanterra’s commitment to the environment. As a result of popular demand, Grand Canyon Railway reinstates limited steam operations at the Williams Depot. After converting locomotive No. 4960 to run purely on waste vegetable oil (WVO), the Railway begins conducting steam trips on its special event train dubbed the “Cataract Creek Rambler”. The Grand Canyon Railway Hotel upgrades several of its Standard rooms to a new Deluxe room type. This adds features such as LCD televisions, micro-refrigerators, and more. The Rail Baron Suite also saw extensive upgrades which included new carpet, paint, furniture, appliances and more. The Grand Canyon Railway Hotel renovates its famous Spenser’s Pub, adding a full kitchen and expanded menu selection. A new class of service – The Christmas Eve Limited – was added to the overwhelmingly popular The Polar Express train. The Christmas Eve Limited is only available one night per year – Christmas Eve – and provides guests with features not available on The Polar Express. The Grand Canyon Depot celebrates its 100-year anniversary. Accommodations include in-room refrigerator and microwave, updated bathroom amenities, and stylish furnishings. 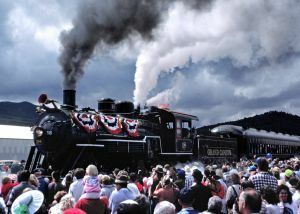 Grand Canyon Railway celebrates the 100th birthday of the National Park Service with a special steam doubleheader. To commemorate the 100th anniversary of the establishment of Grand Canyon National Park, the main dining facility is renamed in honor of our company’s founder, Fred Harvey. Since 1901 the Grand Canyon Railway has enchanted millions of people from all over the world. From its yesteryears of transporting ore to our present-day journeys to the canyon with the help of authentic characters who bring the Old West to life, the story of our railway is almost as dramatic as the spectacular surroundings. The train—whose fate seemed sealed when it was shut down back in 1968 due to the popularity of automobiles—is now responsible for keeping approximately 50,000 cars outside of a national treasure. By traveling aboard Grand Canyon Railway you are not only part of history in the making, you are also doing your part to help preserve the pristine, incredible beauty of Grand Canyon National Park. Back in the late 1800s, the Grand Canyon was a far-off distant land. Only the most adventurous of explorers could rough the elements to see it at its remote location in northern Arizona, which was still a territory at the time. But Americans were on the move and going west. American ingenuity was hard at work in the form of the railroads, being built and tying the nation together. Initially, the main line west was built from Chicago to Los Angeles and it passed through Williams, Arizona. The Railroad was originally built to transport ore in the Wild West from the Anita mines, 45 miles north of Williams, in the late 1800s. Buckey O’Neill, sheriff of Yavapi County, mayor of Prescott, prospector, promoter and later one of Teddy Roosevelt’s Rough Riders, realized money could be made in the mines. He traveled east to gain the support and investment. O’Neill gained the support of Thomas Lombard from the investment firm of Lombard, Goode and Company in New York. Together they entered conversations with the Santa Fe Pacific Railroad. To help gain the interest of the Santa Fe, O’Neill sent ore samples of gold saying he had mined the samples from the Grand Canyon. 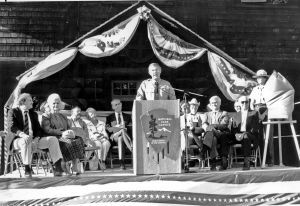 In the same letter, however, O’Neill also recognized the potential for tourism so he spoke to the natural beauty of the region and the canyon. O’Neill continued to flirt with the Santa Fe through the years seeking their investment. He also tried to get local investors, which he did, and in 1897 the Santa Fe and Grand Canyon Railroad Company was incorporated. Development of the tracks north from Williams began. O’Neill would not see its completion. He left to fight in the Spanish American War behind Colonel Theodore Roosevelt where he died in 1898. The railroad changed management and consolidated numerous times in the early year. Finally, the Atchison, Topeka & Santa Fe Railway took over and completed the track to Grand Canyon in 1901. The company could make a return on its investment through tourism because the lure of ore and mining proved to be unsustainable. The $3.95 train ride would replace the $15.00 eight-hour stagecoach ride from Flagstaff, allowing visitors to gaze upon what Teddy Roosevelt said, “Every American should see.” The 65 miles of track the iron horse traveled became the lifeline to Grand Canyon. Grand Canyon Railway made its first journey to the Grand Canyon on September 17, 1901. And since that time, notable passengers to ride the Grand Canyon Railway include Theodore Roosevelt, John Muir, William Howard Taft, Franklin Delano Roosevelt, Dwight D. Eisenhower, Clark Gable, Jimmy Durante, Doris Day, Warren Buffet, and Bill Gates. Over the years, the Santa Fe also built many of the structures that now grace the South Rim. After all, if they were going to start bringing people in large numbers, they had to have a way to accommodate and feed them. When the train first arrived in 1901, tent camps were found along the rim. The Santa Fe approached the development with engineering skills and technology of the times that made a wonderful contribution still evident today. In 1904, the railroad hired the Fred Harvey Company to manage the hotels and restaurants at the Grand Canyon for the Santa Fe, and in 1905, Santa Fe built its flagship hotel, the El Tovar, which became the finest lodging at the rim and arguably in the Southwest at the time. The railroad, in a most progressive move for the times, hired Mary Elizabeth Jane Colter, a woman, to design many of the buildings that have become part of the signature of Grand Canyon National Park. Her distinctive touch stamped an indelible imprint the building at the Grand Canyon with her version of a natural style of Pueblo Indian architecture. Colter is responsible for such landmarks as the Hopi House, Lookout Studio, Bright Angel Lodge, Desert View Watchtower, and Hermit’s Rest. All supplies used in the construction of Grand Canyon Village came to Northern Arizona aboard the train. The train also brought all water to the Grand Canyon until 1926. Supplies were not the only things carried in trains. 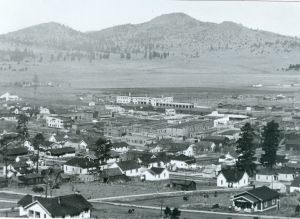 Ranching and lumber were the primary industries of the early 1900s. Ranchers and lumberjacks contracted with the Grand Canyon Railway to transport their stock. The Railway shared the countryside with its neighbors forming a unique bond. Cowboys, lumberjacks and shepherds alike felt a little better and closer to civilization just being able to hear the train or see its lights off in the distance. Grand Canyon Railway stopped service to Grand Canyon in 1968 after ridership declined due to the rise in popularity of automobile travel. The Interstate highway system had been completed and people fell in love with “the road trip.” The train had been a source of regional pride, a symbol of man’s spirit of conquest and a sense of harmony with nature. Interstate highways were built paralleling the railroad, and silently replaced virgin landscapes privileged only to the train with billboards and gas stations. 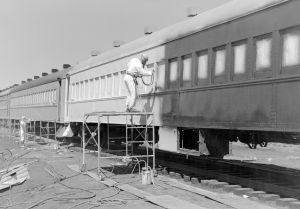 In 1989, Grand Canyon Railway put a stop to the salvage work and began a detailed restoration process. The decaying tracks were rebuilt, the historic depots at both ends of the line were restored, and after 21 years, passenger service once again returned to Grand Canyon National Park. “Max Biegert and his wife Thelma brought an important piece of Arizona history back to life. We have them to thank for the opportunity to travel just as those first passengers did in 1901 to the canyon so appropriately named Grand,” said Railroad Historian Al Richmond. Today, Grand Canyon Railway provides a historic and fun journey to the canyon with the help of authentic western characters who bring the Old West to life. Moreover, the train whose fate seemed sealed when it was shut down due to the popularity of automobiles, is now responsible for keeping approximately 50,000 cars outside of the national treasure.